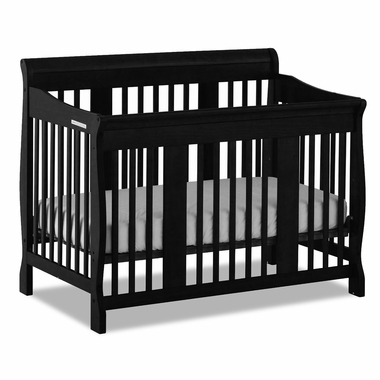 The eye-catching and elegant black finish on the Storkcraft Tuscany 4 in 1 Convertible Crib will give your nursery stylish design with fantastic practical purpose. Its solid wood frame will keep it nice as it transforms through the years into four separate sleeping phases. This option is a great way for your child to have smooth and safe bigger bed transitions, save you money in the long run, and help our planet. All finishes and materials Storkcraft uses are non-toxic for safe and secure surroundings.